"Someday" Big Fred Hewett used to say in his Humboldt Saloon in Aberdeen, Washington, "these pictures will show how the boys used to do it." He knew the day would come when the Pacific Northwest's "Big Woods" would be only a fog-blurred memory and the cry "Logs More Logs " would no longer be heard ringing up and down the skidroads. With the superb views of timber photographer Darius Kinsey, comprising more than 200 pictures made from wet plate celluloid negatives, 11" x 14," and processed by his pioneer wife, Tabitha, author Andrews dramatically presents a panorama of lumbering's great days in these woods from 1890 to 1925. Shown in sharp detail are the first axes, 12-foot crosscut saws, the first oxen and horses, the first donkey engines and "lokeys." Then the story continues into the "highball" days, the high production period with the steel tower skidders and miles of steel rigging. 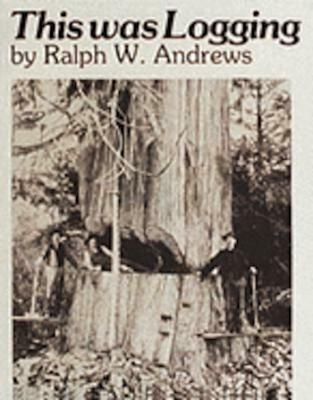 From his home in Seattle, Ralph Andrews has written many books to document American Northwest logging and its people.